This weeks Bloggers Challenge is to use Designer Series Paper (DSP) on your card or project. 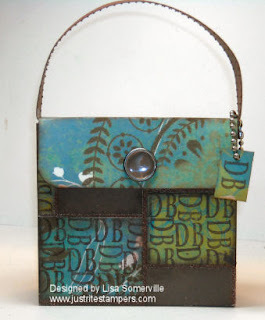 Since I had so much fun with this entry I made for the JustRite Stampin' Champion Contest - I thought I'd make another Designer Tile Purse. Voting for the contest is open through Friday - stop over at the JustRite Blog and vote! The Designer Paper I used for this project is from My Mind's Eye Bohemia Line. I used my JustRite monogram stamps to add the initials of my recipient onto the purse and tag. If you'd like to play along with this weeks challenge, leave a link on this blog post, or if uploading to SCS use keyword BC64. Don't forget to stop by the other Bloggers Challenge Players Blogs to see what fantastic creations they've created this week. Love the colors on this one. These are so fun! You are so creative! Awesome Lisa. This is a wonderful way to showcase DS papers. Your project ROCKS. I like this! Pattern, pattern? Beautiful! You are awesome with those purses. Hope you win the JustRite contest! This is a cool purse!! Love the colors!! This is awesome, Lisa. I love your purse for the contest too!! Cool purse Lisa. Good luck on Justrite. This is just perfect Lisa! Love the purse idea. Share the pattern? This is FABULOUS!!! Very creative and love the DP too. Good luck in the contest! TFS! great purse bag!! i love it! Absolutely fabulous!!! These purses that you make just knock my socks off!! They look so realistic! What a fun project Lisa. I love the rich colors. Great colors, Lisa! I may have to give this project a try--thanks for sharing the template. Thanks for the Get Well Wishes too. I'm feeling a tad better (even did the challenge). Your little purses are just adorable! And My Mind's Eye has such GORGEOUS papers...I can't bear to cut the ones I have! It's great, Lisa! You always have fantastic ideas! TfS!